Steven M. Hall, MD strives to practice medicine in its purest form. Not conventional medicine, not Naturopathic medicine nor Chinese medicine nor Ayurvedic medicine. But medicine that has room in it for everything valid we know about healing. From pharmaceuticals to nutriceuticals, from surgery to spiritual healing. Medical science now believes that every aspect of your life, from how you eat, sleep and exercise, to what you believe, exerts some influence upon your state of health. Therefore, if you have health challenges, any aspect of your life, not just the physical ones, could be their cause. A medicine that can see you, understand you and treat you as a whole human being just makes sense. Developing and practicing that kind of medicine has been Dr. Hall’s professional passion for over thirty years. That is the kind of medicine he will bring to bear upon your health challenges. He calls it Integral Medicine, since it derives from an integral worldview and integrates all that we know about healing. Integral Medicine uses a variety of diagnostic approaches to identify the root cause of your health challenges and then treats the root with an effective blend of the best from conventional and alternative medicines. This generally results in a resolution of the problem, not just a repetitive treatment of the symptoms of the problem. Dr. Hall takes the time to listen to your full story and put the pieces together. A "medical sleuth," he loves to discover the root of your health problems and work together with you to find a solution that fits your lifestyle. He teaches you concrete tools of healing that you can use for the rest of your life. Click here for a list of common ailments Dr. Steven Hall treats. 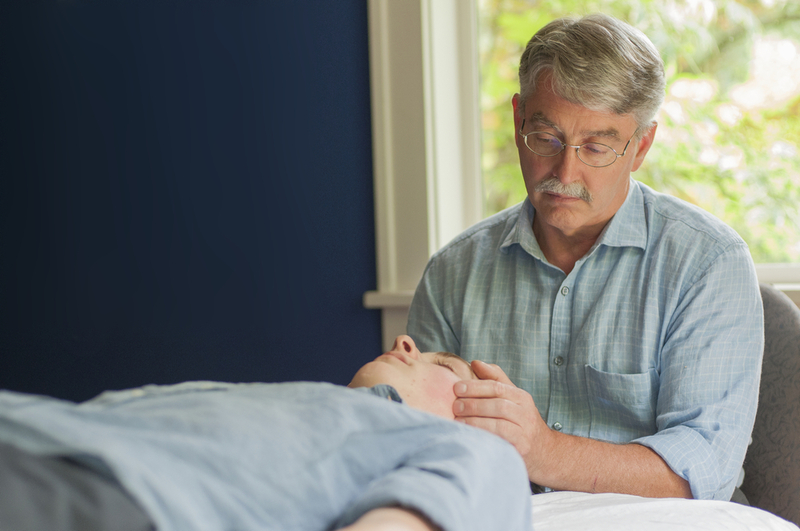 Dr. Hall is doing cranial work to assess a patient's physical symptoms. A series of consecutive cranial treatments successfully alleviated the patient's longstanding discomfort. * The best of both worlds — Dr. Hall utilizes both conventional and natural treatments. As most patients know, it's difficult to find a doctor who integrates both into his/her practice. * Treat the symptoms AND the cause of your disease. He works in-depth with each patient to reach a sound resolution of his/her health issues, both on symptomatic and causal levels. * Dr. Hall teaches his patients specific, concrete tools for healing that they can use the rest of their lives. * Dr. Hall listens, using his head, his heart and his hands, he applies unique diagnostic techniques to help solve problems where others can't. * Cutting-edge medicine. Dr. Hall's unique approach integrates the latest discoveries in science and medicine into each treatment plan. Receive a FREE Guide to Finding and Changing Limiting Beliefs that are Holding You Back! Click the button below to receive Dr. Hall's guide to real lasting inner change; a first step to the whole you. We use the latest in email technology which requires you to opt-in via an email which will be sent to the address you just entered. Once you opt-in you will receive the guide. Protecting your privacy is a priority for us. Tip: to ensure you receive your guide, click Add to Address Book on the opt-in email you will receive so that mails don't go into your junk folder. Check your junk folder just in case. If you don't receive the guide, please click here and let us know. For your security, we selected double opt-in process for sign-up.